Last Saturday evening SP and I decided to give Il Pizzaiolo a try. 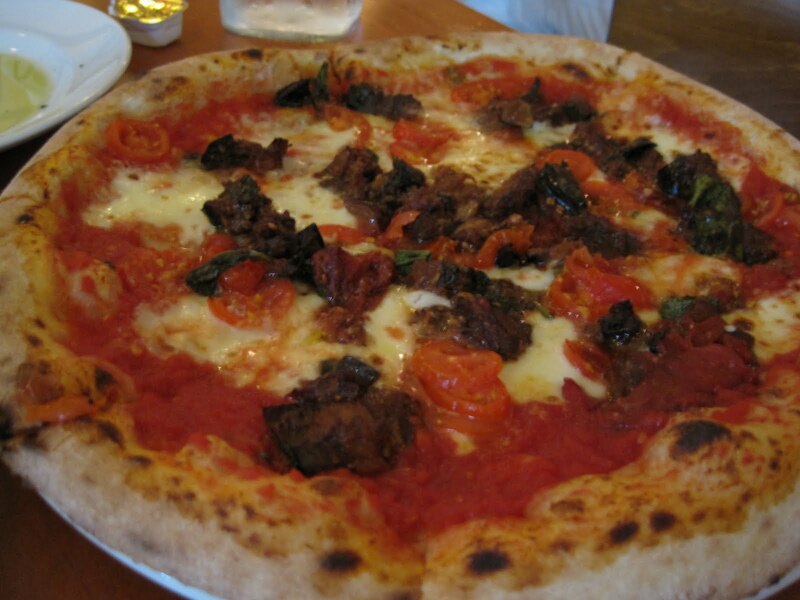 Il Pizzaiolo is on Washington Road in Mt. Lebanon and is next door to Bistro 19. Il Pizzaiolo opened in 1996. I know I've eaten there, just not in a very long time, and if it opened in 1996, then I would guess I last ate there in 1998 or 1999. I remember really enjoying my meal. It was always a very crowded place and for some reason, I never made it back. In recent years, it seemed that many thought the restaurant had changed, and not for the better, that prices were higher and quality/quantity lower. Flash forward many years, and Il Pizzaiolo made it back onto my radar. Low on my radar, though, because based on numerous reviews on sites like Urbanspoon, it seems there is a lot of debate on the quality (and price) of the food - namely, it seems you love the pizza or you hate the pizza. 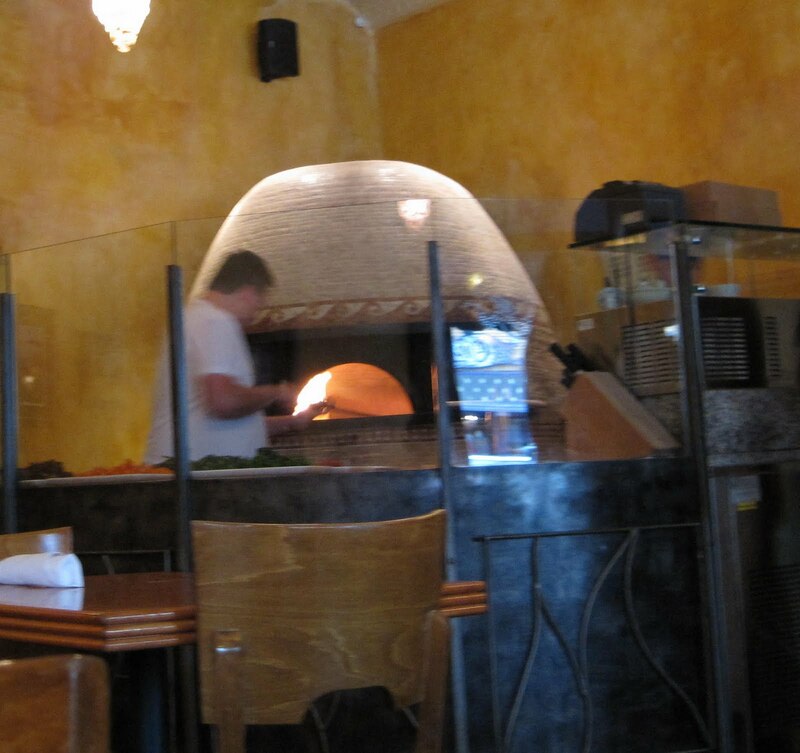 Then in early July the Pittsburgh Post-Gazette reviewed Il Pizzaiolo and while it wasn't a glowing, amazing review, it was a positive review. Not long after, the Pittsburgh City Paper reviewed it and gave it 3 out of 4 stars. Then Spicy & Blue visited and gave it a favorable review. So, since the outbound Fort Pitt tunnels were closed this past weekend (no way were we going to go into town and then try to get home, which made us sad because we'd been hoping to get to Te Cafe) and since we wanted something new to us, we decided to try Il Pizzaiolo. We arrived around 5:30 and were surprised to discover that only 2 other indoor tables were occupied. There was a wait for the patio, and since we had felt a few sprinkles and it was pretty darn cloudy, we decided to eat inside. You can see the brick oven from your table in the dining room - it was fun to watch the flames and smoke from the hot, hot oven. Drinks. Drinks were difficult. I wasn't really in the mood for alcohol plus I didn't recognize 98% of the wine menu plus the cheapest wine by the glass was $9 and we were trying to be a little careful since it was the end of the month and we were already pushing the upper limits of the budget. None of the beers really grabbed SP's attention. I ordered iced tea and our server informed me that the iced tea was bottled and in 2 flavors and pre-sweetened. I am a fresh brewed girl, so I cancelled the iced tea. I rarely if ever drink soda. So I asked for water while I thought about things. SP ordered diet coke and it arrived in a bottle. 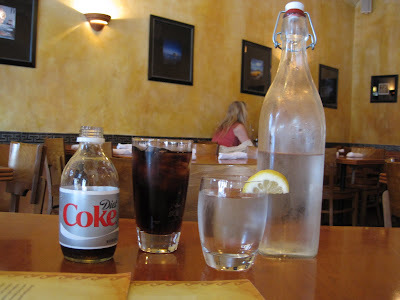 Maybe it's the Pittsburgher in me, but I do not like when places like Il Pizzaiolo and Dinette serve you soda from a bottle. No refills. $2 for a soda smaller than the initial glass serving size at other restaurants. SP drinks a lot and if he hadn't controlled himself and switched to water, he could easily have spent $6-$8 on diet coke. I did like the water bottle left on our table and the lemon wedges on the water glasses. I did not like that we got water only after I asked and not as an immediate given since I witnessed other tables being served water as soon as they sat down. With our drinks came bread with olive oil. The olive oil was plain (nothing floating in it) but very flavorful, almost fruity. 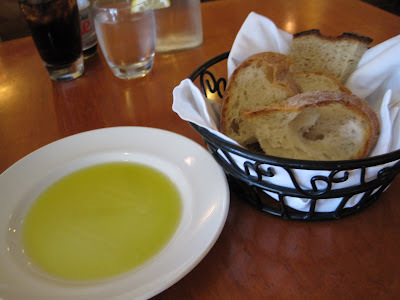 Very tasty and we ate all the bread and some of a second bread basket, mopping up all the olive oil. 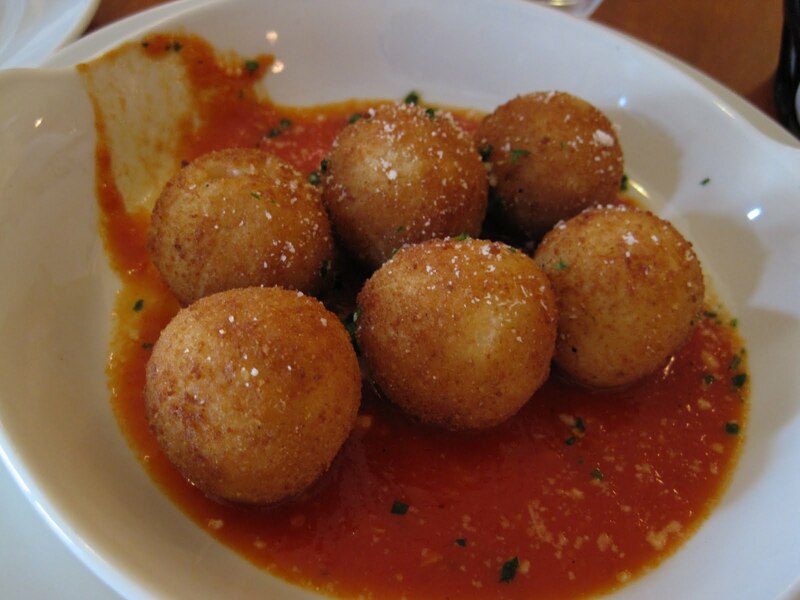 We decided to share an appetizer of Arancini (rice balls stuffed with mozzarella and fried): They came sitting on a bed of marinara sauce. These were very tasty. It's very hard to make something fried taste bad but it has been known to happen! The marinara was delicious and very tomato-y with a hint of parmesan flavor. 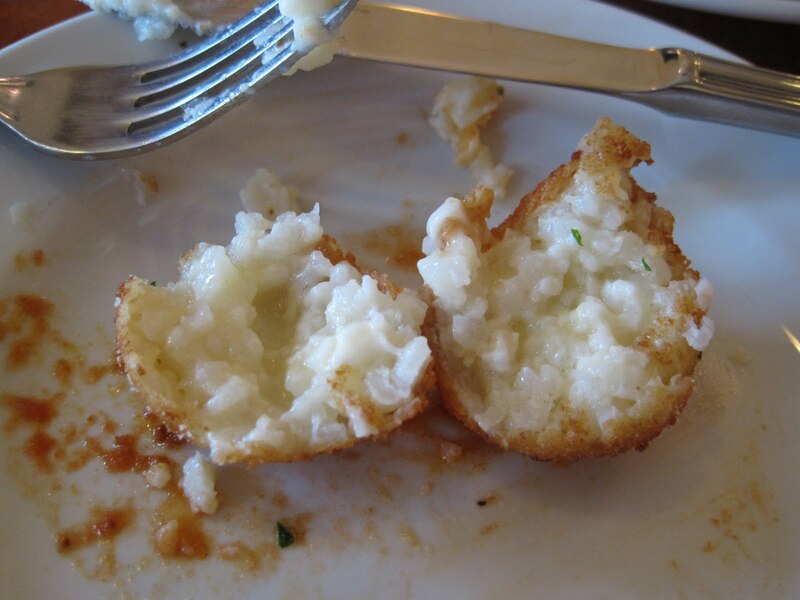 The rice balls were moist. My only complaint is that in a couple of the balls, the mozzarella was still cold. The marinara was so tasty that we used our bread to mop it up! We decided to share 2 pizzas. One was a prosciutto & arugula pizza: The tip of the slices, the middle section of the pizza, was not soggy though it was not thick enough to support the weight of the toppings, which I imagine is true for any thin crust pizza. 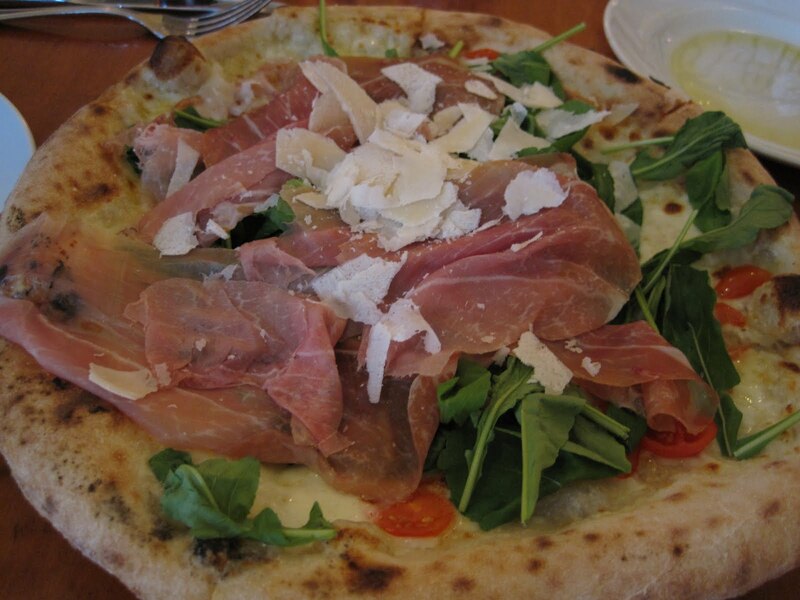 The prosciutto & arugula were added after the crust and cheese were cooked. There was a very generous amount of prosciutto. And cheese shavings on top - yum! Our second pizza was the Vesuviano (I think that's what it was called) - smoked mozzarella, eggplant, sauce. Unfortunately, they were out of smoked mozzarella but offered to make us the pizza with regular mozzarella. I sort of wanted to re-examine the menu, but SP didn't want to look at it again so we said OK, make it with regular mozzarella. But we both were really sad because we were really looking forward to the smoked mozzarella-eggplant combination. It was tasty. The tips of the slices were a bit wet - this was definitely a wetter pizza, but I wouldn't say soggy. It was quite good, but we both preferred the prosciutto & arugula pizza. Of course, that seems to be our favorite flavor pizza. We were too full for dessert and/or coffee. I can see why some people think the pizzas are too expensive. I think the quality of the toppings and the quantity justifies the cost (there was a lot of prosciutto on that pizza!). But if you're the kind of person who needs a pizza this large for just yourself and you are not 'into' specialty pizzas like this, Il Pizzaiolo may not be the place for you. We found the pizzas to be large enough that we could have shared one. Next time, we'd probably share an appetizer, share a salad, and share a pizza. Those with large appetites may need an entire pizza to fill them up, but we definitely did not. As for the too wet, too soggy crust complaints, I can't say that we experienced that. By 6:30, the restaurant was filled inside as well as outside. There were families, dates, friends getting together. It was much louder inside when the dining room was filled. Our server was fine - I'm glad she explained about the iced tea instead of just bringing me something I would not have really wanted and it was nice that she offered to make the eggplant pizza with different cheese or for us to pick another pizza. When describing the daily specials, she made sure to explain that the mushroom risotto contained chicken broth, which is very good for vegetarians to know.